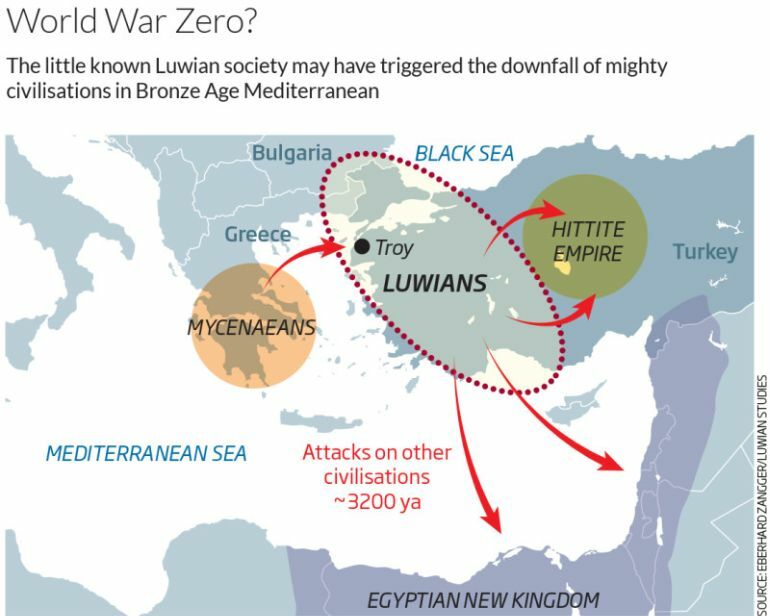 Was Late Bronze Age Afflicted By A 'World War Zero'? Back in March, we talked about a 3,200-year old massive battle that took place in the cultural ‘backwaters’ of Bronze Age northern Europe (circa 13th century BC), and how this mysterious encounter involved over 4,000 well-armed men from different regions, including Poland, Holland, Scandinavia and even Southern Europe. Intriguingly enough, there also seems to be a date-oriented significance relating to 13th century BC. Within a generation of these contemporary times, the increasing scale of warfare and over-arching political affairs seemed to have swept through many parts of the known world, including the eclipse of the Mycenaean Greeks, the invasion of Egypt by the ‘sea-people’ and the concurrent downfall of the Hittites. And furthermore, there is also the literary narrative of the Trojan War – a large scale conflict (and possibly the proverbial ‘last hurrah’ of the Mycenaeans) that pitted the Greeks against the mystifying Trojans. Considering all these ‘mega’ events of the ancient times, archaeologist Eberhard Zangger has alluded to what he calls ‘World War Zero’ – a seemingly cataclysmic scenario that severely affected and ultimately shattered the thriving nature of eastern Mediterranean Bronze Age civilizations. Luwiya is mentioned as a foreign country in the Hittite laws (about 1500 bc). It probably coincided roughly with Arzawa, a large region composed of several principalities in western or southwestern Anatolia, and Kizzuwadna, a district occupying the Cilician Plain. Both Arzawa and Kizzuwadna were independent kingdoms during the Old Hittite period (c. 1700–c. 1500 bc) but later became vassals of the Hittite empire. Linguistic evidence testifies to the cultural penetration of the Hittite empire by Luwians. As for this seemingly ‘wild’ conjecture put forth by Zangger, the archaeologist (who is also the head of international non-profit, Luwian Studies, based in Zurich, Switzerland), the Luwians were intrinsically powerful because of the availability of natural resources in western Anatolia, including the region’s rich minerals and metal ore deposits. Moreover, based on satellite imagery, it has been found that the proximate areas of Anatolia were quite densely populated by Bronze Age standards, with evidences of around 340 big settlements found in the region. Now regarding literary evidences, as the last sentence of the Britannica excerpt confirms, Hittites were already aware of the rising power of the collective kingdoms of western Anatolia, many of which had the lingua franca of Luwian. In fact, historically some of these ‘Luwian’ factions did unite together (periodically) to make their forays, raids and even invasions of the nearby Hittite lands. One of such major incursions, along with pressure from the eastern Assyrians, might have brought about the ultimate downfall of the Hittite empire. Zangger continues with his conjectural narrative about how these victorious Luwians then (perhaps) coveted the rich lands of the Egyptian realm. Thus come in the Egyptian texts that document the arrival of so-called ‘Sea People’ – who could have been the Luwians sailing across from ‘distant’ Anatolia to raid northern Egypt. 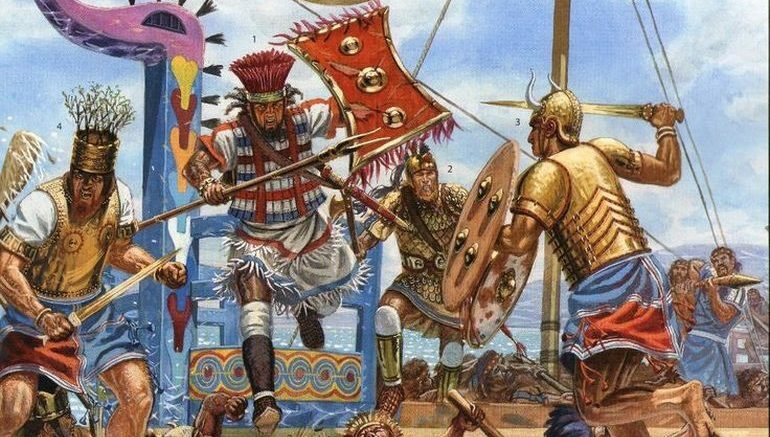 Finally, threatened by the warmongering and other baleful international affairs, the Mycanaean Greeks braced up for an imminent invasion by the Luwians – by attacking the enemy first through their own large offensive, as described in Homer’s Iliad. However on nullifying this external threat from Anatolia (aka Trojans), the Mycanaeans squabbled among themselves, and soon civil wars snuffed out their flourishing culture – as hinted at in Homer’s Odyssey. But of course, from the historical perspective, this expansive (and world-changing) sequence of events of World War Zero is entirely hypothetical – with no exact clue pointing to Luwian dominance in contemporary political affairs. And from the archaeological context, researchers have come across ruins of many Anatolian settlements (circa late Bronze Age) that bear the destructive marks of warfare – but the collective scope remains vague in (specific) relation to Luwians. But since we brought up history, there are rare occurrences of ‘latent’ powers being ultimately responsible for toppling the more conventionally powerful empires, in spite of their relative unfamiliarity in global affairs. One pertinent example would obviously include the burgeoning Islamic realm (after Mohammed), circa 7th century AD, that managed to defeat two contemporary ‘superpowers’ of the time – the Eastern Roman Empire (Byzantine Empire) and the Sassanian Persian Empire, to claim their subsequent Caliphate. Archaeologists will need to discover similar examples of monumental art and architecture across western Anatolia and ideally texts from the same sites to support Zangger’s claim of a civilization. He’s [Zangger] really getting the ball rolling to do larger holistic studies of the area,. I’m actually quite excited that he’s bringing attention to this region.